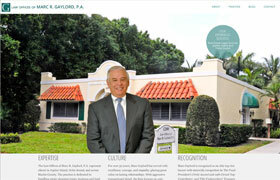 Marc Gaylord has been practicing real estate law in Martin County, Fla., for over three decades. Because his office serves with such a high degree of excellence and puts such a great value on relationships, expressing these values in words, within the website’s framework, was our biggest challenge and most rewarding accomplishment. The firm’s residence is a classic art deco style stucco building with a flat roof and red tile accents—an icon in historic Hobe Sound, Florida. We represent this civic-minded and philanthropic attorney by using this classic building so loved by locals as the site’s hero image. We paired a simple, condensed sans-serif font in headers with a business-like serif font with a palette of teal and grays. Sophisticated without being stuffy. Photography was provided by Leo Arbeznik from Images in Paradise.